Centre Point Properties put a Sloan’s Lake office building under contract and saw occupancy jump by 30 percent by the time it closed the $11.05 million acquisition. The Sloan’s neighborhood is changing at a “mind-boggling” pace, said Centre Point President and founder Tucker Manion. Centre Point, with joint-venture partner Abington Emerson Investments LLC, bought the 50,000-square foot Sloans 1525, located at 1525 N. Raleigh St., from LCP Development. The deal included an adjacent 6,000-sf retail building anchored by Starbucks and involved a tax increment financing component that added complexity to the transaction and $1.77 million to the price. The properties sit on West Colfax Avenue, next to the new Alamo Drafthouse and in the center of the Sloans mixed-use redevelopment. “We love the location,” said Manion. “Looking at it from the office perspective, not only is it a Class A, LEED-certified building that we are buying, but we’re going to be marketing it at $21 a square foot; the triple nets are another $9. So that’s a huge cost incentive to rates for the same quality of building in downtown Denver. “We think we’re going to be able to pull from tenants in the LoDo and uptown area, and also we think we’re going to benefit from suburban tenants that want to be a little closer to downtown Denver for recruiting purposes but don’t want to be downtown. That’s initially what we saw in this project, and then as we started to see the pipeline of tenants come in while we were under contract, it fit that description perfectly,” Manion said. Darrin Revious and Ana Sandomire of NAI Shames Makovsky, who were responsible for office leasing, represented the seller in the transaction. Chris Riedl of Community First Commercial Real Estate represented the buyer. 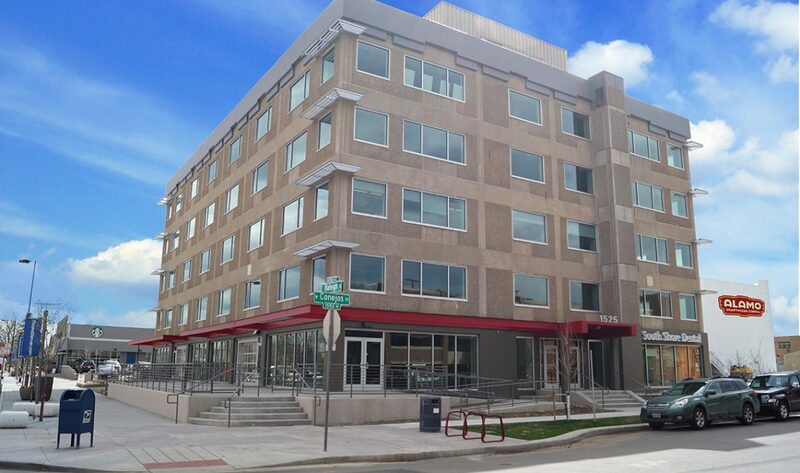 LCP Development redeveloped the 1972 office building, where Goosetail Spaces recently leased the 10,266-sf top floor. Office tenants also include Strategies Capital, LoHi Physical Therapy, RE Solutions and Mundus Bishop Design Inc. Kiwi International Delights & Coffee Co. and South Shore Dental occupy the ground floor. Ryan Stout and Nate Bradley of Cushman & Wakefield will market the remaining 21,000 sf. Even Stevens Deli will join Starbucks in the newly constructed retail building, which has a 1,700-sf space available. JCR, sourced through Essex Financial, financed the real estate. Centre Point Properties owns more than 500,000 sf of office and retail space in the Denver area.